For other people named Samuel Moore, see Samuel Moore (disambiguation). 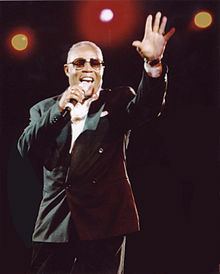 Sam Moore and Dave Prater were both experienced gospel music singers, having performed individually with groups the Sensational Hummingbirds and the Melionaires. They met in The King of Hearts Club in Miami in 1961, where they were discovered by regional producer Henry Stone, who signed them to Roulette Records. After modest success at Roulette, they were signed by Jerry Wexler to Atlantic Records in 1964, then being "loaned" out to Stax Records to produce, record and release their records. 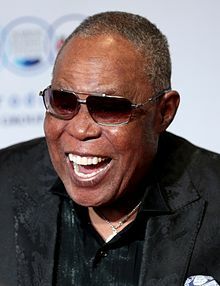 Sam & Dave performed throughout most of the 1970s until 1981, and enjoyed a brief resurgence in popularity due to the Blues Brothers's 1979 recording of "Soul Man". Their last performance together was on December 31, 1981, at the Old Waldorf in San Francisco. On April 9, 1988, Prater died in a car crash in Sycamore, Georgia. On 19 January 2017, Moore sang a rendition of "America the Beautiful" at incoming President Donald Trump's inaugural concert in Washington. Before his performance, Moore stated that he was "honored" to be a part of the ceremony and would not give in to pressure from left-wing activists to cancel his performance. On 1 September 2017, age 81, Moore performed live at the Royal Albert Hall BBC Proms with Jools Holland and his Rhythm & Blues Orchestra in a tribute concert to 50 years of Stax Records synonymous with Southern Soul music. ^ "Results - RPM - Library and Archives Canada - Adult Contemporary". RPM. Archived from the original on October 21, 2012. Retrieved March 3, 2011.